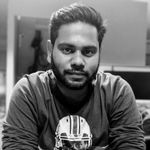 Hi, I am currently working as a concept artist at TinyShark Interactive, a game studio based in Hyderabad, India. Our studio is currently gearing up for a Kickstarter launch of our first ever board game, "Spacebabies N Robots". I have worked on this game as a concept artist as well as I am one of the creators of this game.